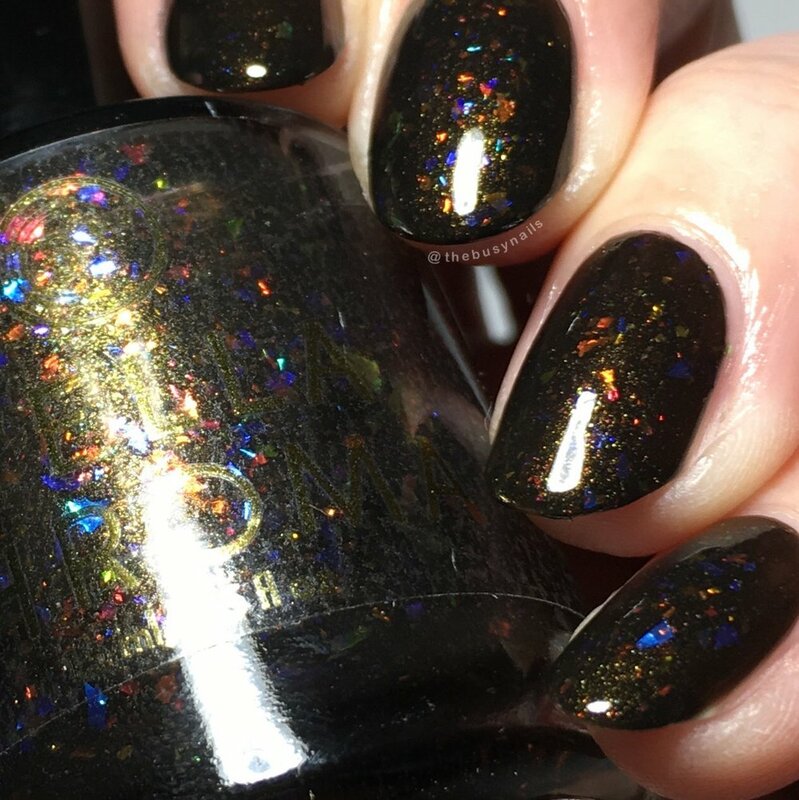 Stella Chroma has created a Harry Potter-inspired polish and sugar scrub for Polish Pickup March 2018. I have the polish to share with you today. Edited to add: I now have a review of the sugar scrub as well, and you won't want to miss it! Check out their FAQ page or the Facebook group for more info if you're not familiar. 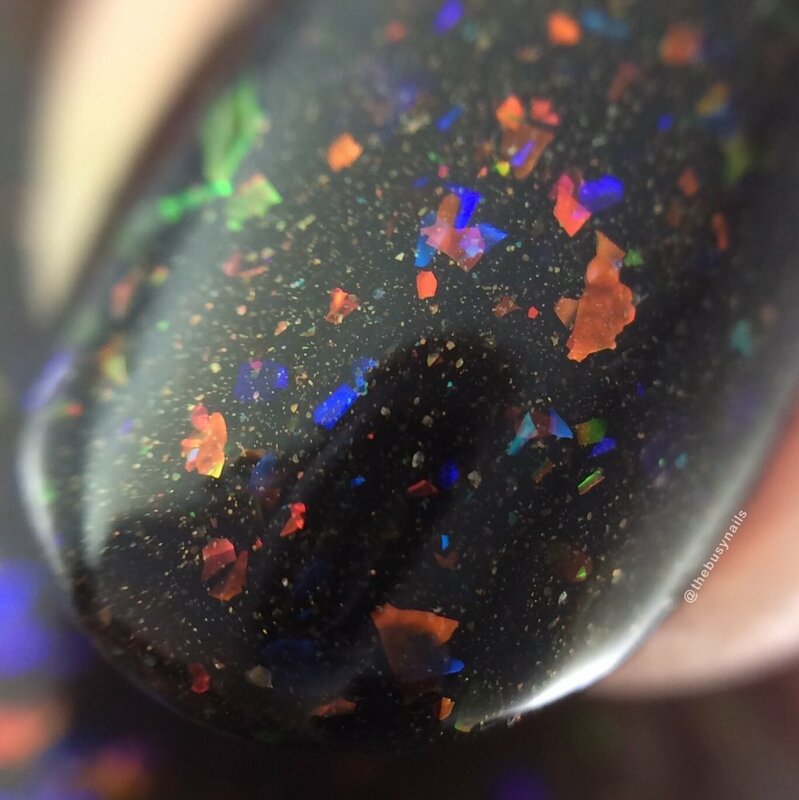 HOW TO BUY: You can purchase this and polishes from other makers on the Polish Pickup website starting March 2nd at 11 AM EST through March 5th at midnight EST. All photos in this post are taken under artificial light. All are topped with Glisten & Glow HK Girl topcoat. This polish was provided for my honest review. Formula: Good formula. It goes on easily and the flakes spread out evenly and lay flat. My thoughts: I really enjoyed this polish on my nails. 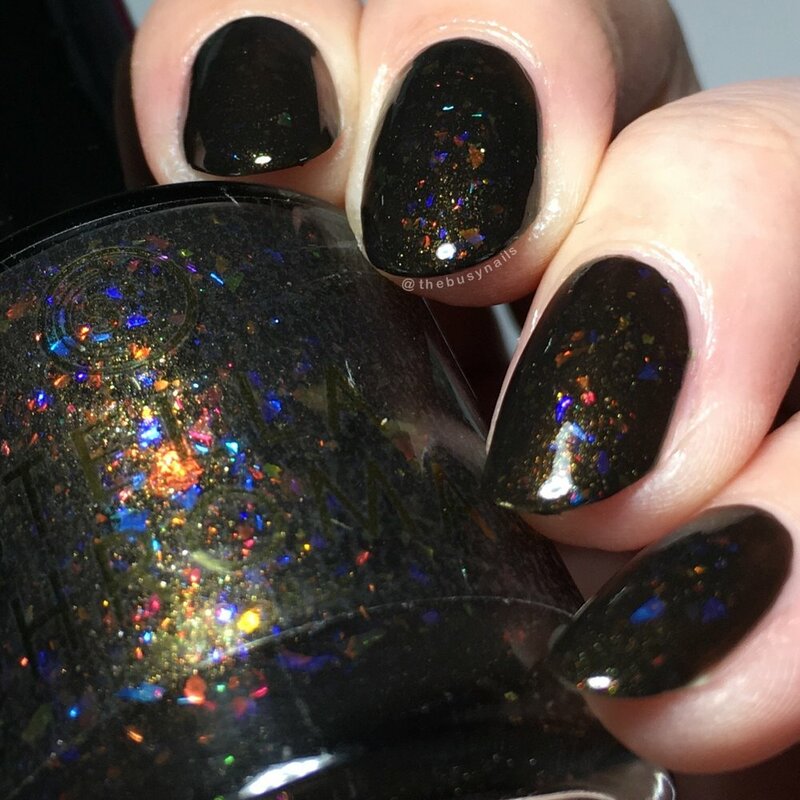 It's vampy, yet chic, and the flakes really stand out against the dark base, but it's not an in-your-face flakie polish. It also plays off the inspiration photo really, really well. The gold shimmer is a lovely added touch. I also think it's worth noting that Stella Chroma's bottles and labels are so gorgeous! Scent: Butterscotch and vanilla and buttercream frosting. No beer scent here. Instructions: Scoop out some of this lush, moisturizing scrub. (my note: a little goes a long way) Add a bit of water and massage in to your skin. Say bye bye to dry, dead skin cells. My thoughts: I LOVE sugar scrubs. I use one at least weekly and have tried many brands. First off, the jar this comes in is a nice quality and looks great in my bathroom counter (where it promptly earned a spot). The scent is really nice too. Warm and sweet, smelling like butterscotch and creamy frosting. It would also make a delicious candy or candle. It’s not overpowering at all which I appreciate. This scrub is very firm to the touch, but still easy to scoop out. A little goes a long way! It scrubs easily with a little warm water, and turned almost lotion-like while I scrubbed. It rinses easily and left my hands very smooth and soft, but not at all greasy. Noticeably smooth and soft, considering I use sugar scrubs regularly. The scent left on my hands is nice and soft and not overkill. It’s safe to say I’m a big fan already! You can purchase "Let Me Show You" polish and the Butterbeer sugar scrub on the Polish Pickup website starting March 2nd at 11 AM EST through March 5th at midnight EST.